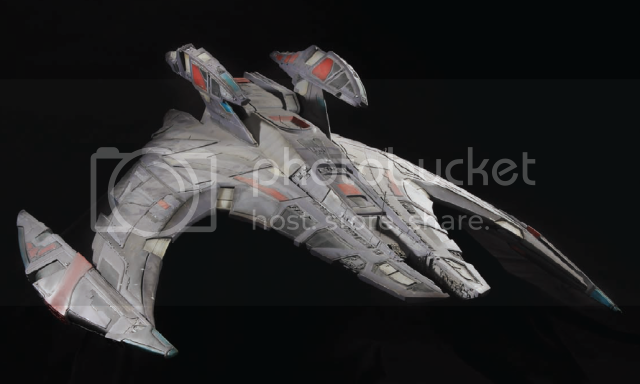 The Jem'Hadar model, lot # 1487, as offered by Profiles in History is not the screen used model that was sold by Christie's in the 2006 Star Trek sale. It is most likely not production made either. Here is what I can tell you for sure. When I visited Profiles in History to view the Star Trek lots, I got to see the Jem Hadar model . Joe Madalena was there and said it was the one from Christie's. I inquired about that as I knew it was a model I had been offered in 2007, but he insisted. Now I knew the telltale was that the Profiles one has wires, and the real screen used version, sold at Christie's, didn't have wires. SFX models never do. That are mounted on poles or motion control rigs. In the Profiles picture above, where you can see the wire in the front nose of the ship sticking up. In the photos below you can see the wires very clearly. I can say positively that the Profiles version is it is not from Christie's. It is unclear if this was even production made, though it supposedly was made by the effects house that made the screen used one that Christie's sold. The owner got the model from the effects shop around 1999. It may have been made at the same time as the one delivered to Paramount, but never delivered to production. First of all, the collector who offered it to me said it wasn't when I contacted him Saturday. He was just the broker at the time, but he is very solid and represented the seller. Star Trek never hung models like this, they were mounted on a pole for motion control and filming. 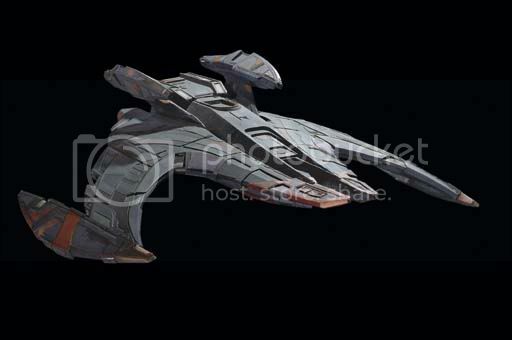 Here is an image of the real model that Christie's sold being filmed for DS9. (courtesy of Doug Drexler). Note the ship is mounted upside down so they could shoot the bottom of the ship, which is the angle we most often saw. Not only does the real model not have wires, but there were a lot of white marks on the leading edges of the wings on the Profiles model (seen on the left wing in the Profile photo above, but very noticeable in person). The colors seem very different, but that might be the lighting in the photos. Also, the Christie's version was lighted and this one is not. There is no question these are two different models. 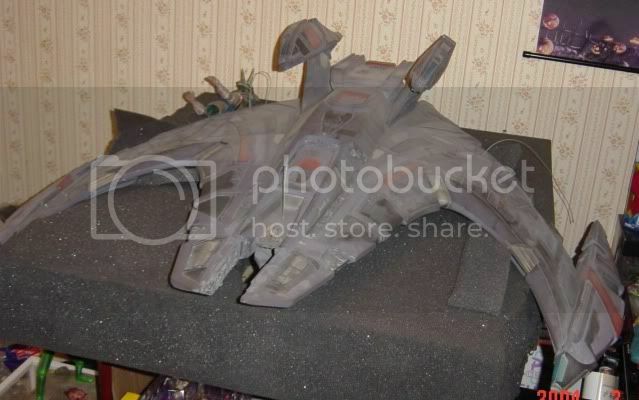 The photos below are of the model in the Profiles auction, taken by the owner and sent to me when the owner was trying to sell the model in 2007. You can clearly see the wires. 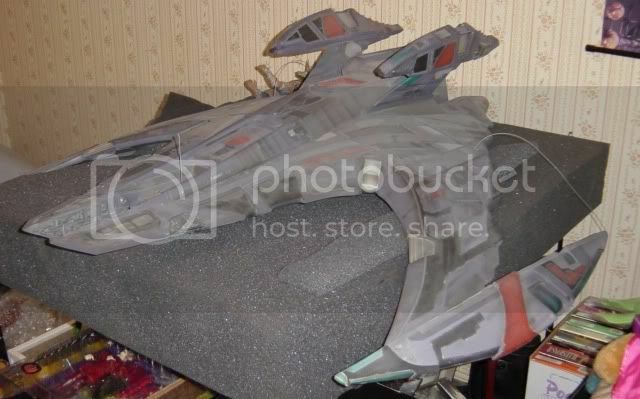 This model was bought by the owner directly from the effects shop around 1999, which is when Deep Space Nine finished filming. It is highly doubtful that if the model was made for the production, that they would have sold it. That is asking for a major lawsuit and would be theft. But, if the shop made it for their own use, then that would be no problem. 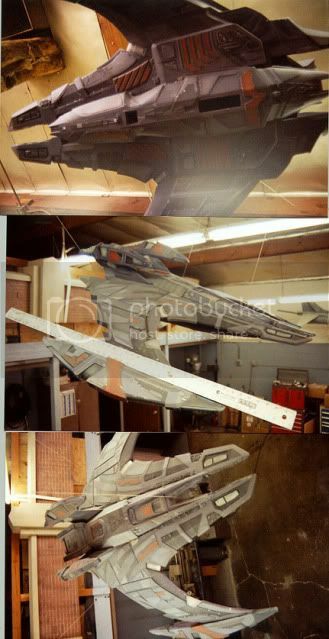 The photo below show the ship as it hung in the effects shop that built it. This model is not a screen used piece. It most likely wasn't made for Paramount either, but instead made by the model shop for their own display purposes. I assume Profiles claimed this was from Christie's because the consignor told them it was. That bothers me a great deal. Why would someone lie about this? Well, if you answer that question, you will understand the inherent problem with this hobby. Yesterday I got the chance to visit Profiles in History to examine some of the Star Trek props myself and others have expressed an interest in. I had arranged this with Brian Chanes, Joe Madalena's right hand man, but sadly, Brian's father passed away on Monday and our prayers are with Brian and his family. In Brian's absence, Ryan Dohm and Fong Sam greeted my friends and I and showed us the goods. Joe himself came out and answered questions as well. So we were very well treated and got to see everything we wanted to see. This is the biggest Star Trek live auction since Christies in 2006 and there is a huge selection of hand props. A lot of people on the Star Trek Prop, Costume & Auction Forum have been asking me where all these props came from, especially since much of this should have been in either the Christie's or It's a Wrap auctions. Well, there are multiple consignors, but the majority of the hand props are from a well known LA prop collector. He bought most of this from someone who worked at the Paramount warehouses and sold them out the back door to him over a period of years. Because of this, a lot of collectors have been worried about buying these items. So I spoke to the people in charge at both Paramount and CBS to make sure there would be no repercussions if people won these items, and both basically said the same thing: that it happened a while ago and they have no intention of doing anything about it. So you need not worry about Paramount or CBS coming for their property! Of course a lot of people don't want to talk about this, but it is the dirty little secret of the Hollywood memorabilia hobby: much of it walked out the back door! And the studios usually haven't worried about it, since previously they never really valued these items much. But now things are different. Because of the Christie's Star Trek auction or the Propworx BSG auction, studios now realize they have a real asset on their hands. The head of asset management at Paramount has made it very clear that if anything from the new movie gets out, they will go to whatever lengths to recover it (the items in Julien's auction were cleared for auction for charity by JJ himself). So this situation won't be happening with Star Trek again. So back to Profiles. I examined over 50 lots and none failed to meet my expectations. This really is a good selection of items. There are so many great props that I think everyone will find something they like. Over the next two weeks I will be highlighting some of these items. Let's start with the Tricorders! I mean there are TWELVE of them! You wonder why Christies or IAW had none? Well, here they are. What I did was make a spreadsheet of them all. So if you want a Tricorder, this is your best chance. There are so many that the prices are bound to be lower. Last Profiles auction a medical Tricorder went for a hefty $ 10,000. I think that is way too high. There have been two working Tricorder sales in the last year for $ 5,000 each, and I think $ 5-8,000 is about right depending on the version. 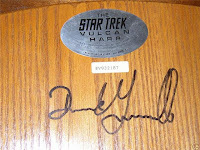 So keep checking back, and I will be posting more thoughts on all three Star Trek auctions. Details: 292 lots, mostly hand props. Of this, 10 are TOS props & costumes with additional assorted ephemera. An excellent selection of props from TNG on up. 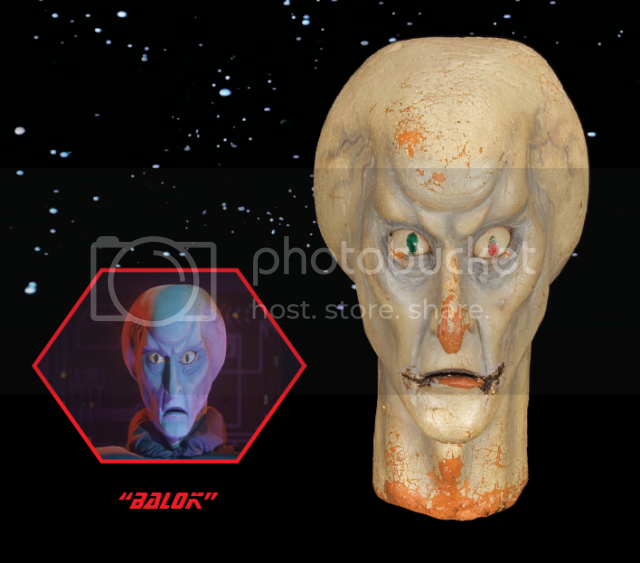 Highlights: Balock Puppet Head from TOS. 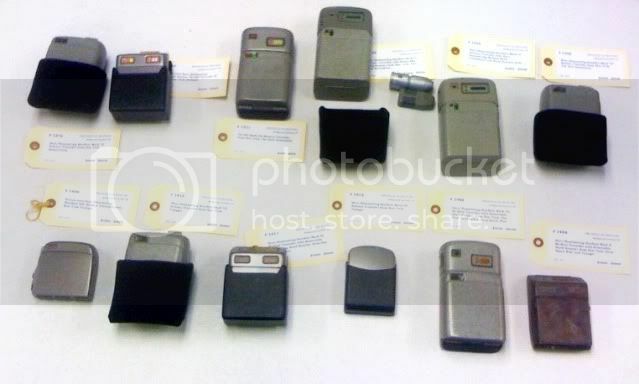 12 Tricorders in one auction! Profiles is the biggest Hollywood memorabilia auction house. They have a 3 day auction and 1533 lots, of which 292 are Star Trek, which are auctioned on Day 3 of the sale. They have picked up the quality of their Star Trek research by using Jorg, so there are no mis-identifications and the descriptions are pretty accurate. Good photography with small screen shots of many items does most items justice. I would like to see bigger photos and less items per page; a difficult proposition with so many items though. The auction will be trying for most collectors without big wallets in bad economic times. There are so many good items, and prices may be depressed with so much quality. I know I won't be able to afford all I want, but I hope prices will stay down and there will be some real bargains on the non-weaponry. Details: Roddenberry Estate Sale, Shatner memorabilia, 17 JJ Movie props & costumes. Highlights: The 17 items from the new Star Trek movie. Spock parka is the best piece. The Roddenberry and Shatner stuff is mostly not of interest to prop & costume collectors. While Julien's does a great job with this catalog, I wonder how big the audience for these items are. 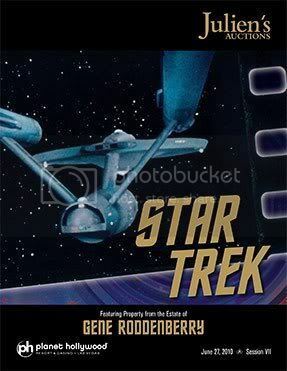 The Roddenberry items are interesting, if only to give an insight to the Roddenberry's life. There are some great Majel Roddenberry Lwaxana Troi costumes that will go strong I think. Many of the Shatner items are incredibly BLAH! I mean toys? 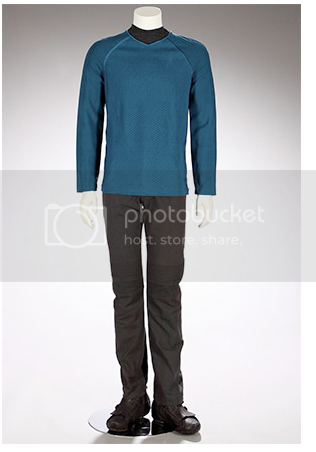 The 17 new Star Trek movie items are all very good and the first we have seen for the most part. However, I think these will all go way too high. Collectors need to remember that these pieces are part of a much larger inventory that at some point will get sold by Paramount. So if you are patient, you can get what you want a few years form now much cheaper. I mean, how many Red Cadet costumes did you see in that movie? The props are different. Not many of those. They will all go high. The communicator will go over $ 10,000 for sure. There is one item I am after and I expect to pay WAY too much. As long as you accept that you are over-paying, and you know that means you will probably not get your investment back, you will be fine. Details: Doug Drexler, Mike & Denise Okuda and Rick Sternbach collections. 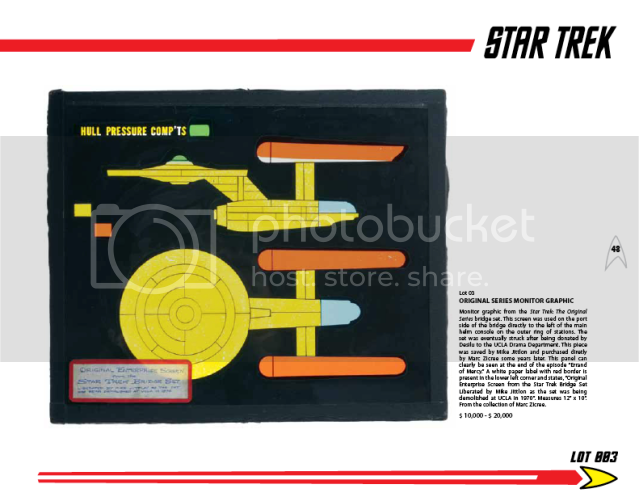 Highlights: TOS Translight, Kirk Spacesuit filming miniature, 5 dedication plaques. Oh what can I say? Certainly the most fun of all the auctions since it will be at the Creation Star Trek Convention! 5 days of Star Trek with a few dozen of the Star Trek Prop, Costume & Auction Forum members, is always a blast. There will be a special dinner get-together for Forum members and blog readers so be prepared to make new friends and socialize with old ones. Oh, and the auction! I am too close to the Propworx auction to give a fair evaluation of it. We had a blast working on this auction and we know our passion shows through in the catalog. You can download it here. We think there are some pretty amazing pieces in the auction and we tried to make the catalog something every collector will want, even if you don't bid in the auction. The Sternbach art and Okuda crew gifts both have items that will go in a price range any person can afford. 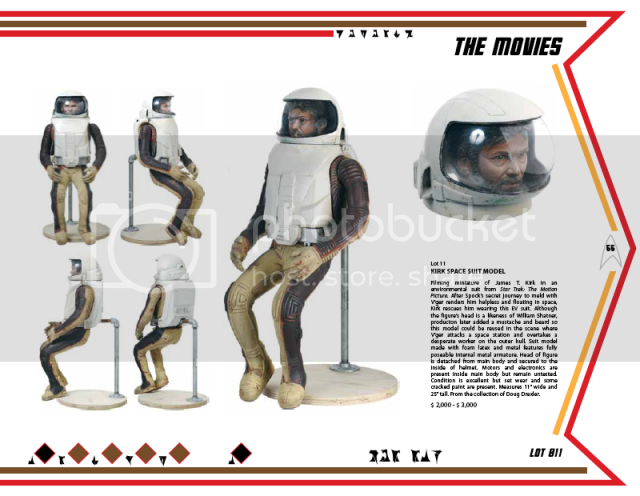 On the other side, the TOS translight and Kirk Space Suit model from TMP are both top of the line. So something for everyone. What we are shooting for is the best auction experience, and between the catalog and the live auction event, we are pretty sure we will achieve that. After all, life is about experiences, not stuff. Well, come back tomorrow when I start my review of the Profiles auction! 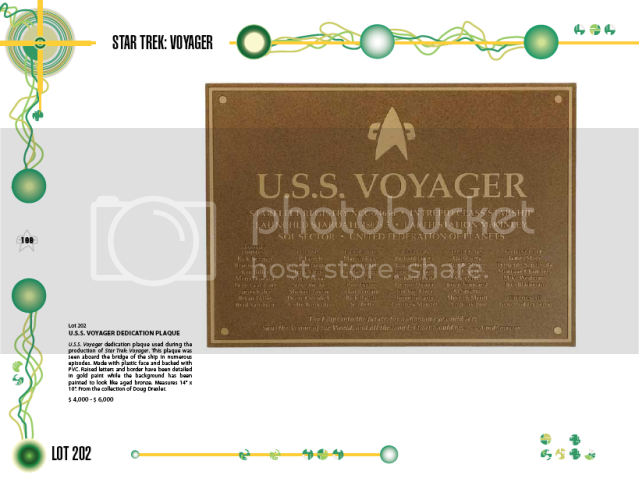 As of today we passed 1500 downloads of the Star Trek Auction catalog! Thank you all for sharing your comments about how much you love this catalog! Will there be a print version of the catalog? Yes. The print version will be shipped the week of the San Diego Comic Con and available there at our booth as well. How do I order the catalog? We will have an order page up soon. 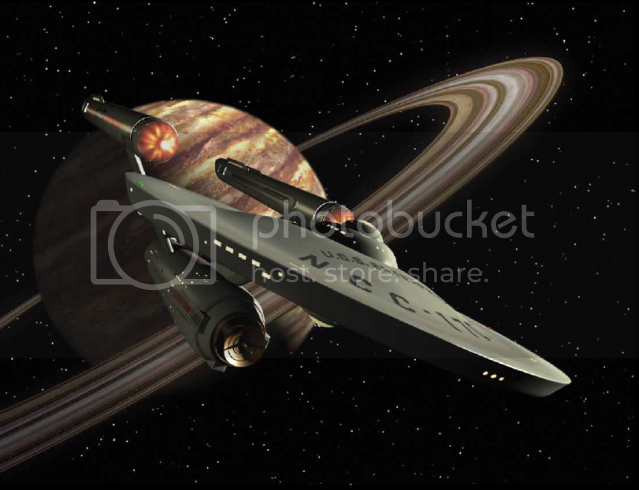 Make sure you check out the Star Trek page on propworx that will launch this week. The Catalog will be $ 30 or 2 for $ 40. We are doing this because a lot of people buy one catalog to mark up their wants and use it at the auction, but they want one for their collection. So we are discounting your second copy! Yes! We will most likely be using the same system we used for the Iron Man auction. You will be able to bid in advance, like on eBay, or bid from anywhere in the world! Do I need a ticket to the Creation Star Trek Convention to attend the auction? Yes! Sorry, but you have to buy a ticket, which are readily available. And why wouldn't you want to? The convention is great! So there you go! We will be launching the Star Trek portion of our web site this week and will be updating it every few days. So stay tuned to www.propworx.com! The Propworx Star Trek Catalog Is Now Available For Download! 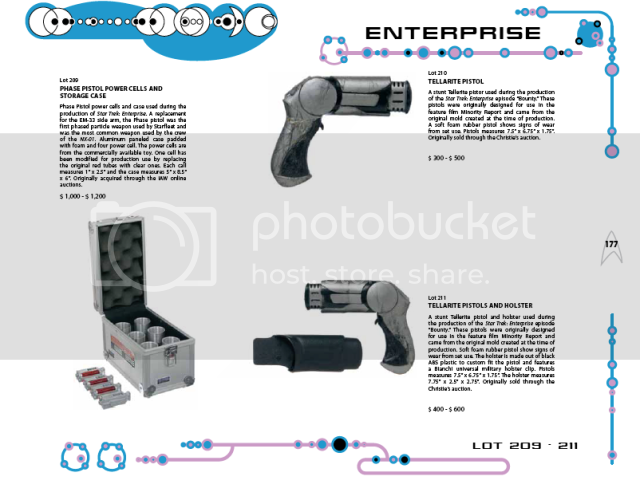 Well, the best Star Trek auction catalog yet is on its way to the printer in China for the full Propworx treatment and you can download the PDF now! If you liked the Iron man auction catalog, you will love this one! 296 pages and 450 lots of beautiful Star Trek props, costumes & set pieces from Star Trek art directors Doug Drexler, Mike & Denise Okuda and Rick Sternbach. 2) Lot 212, The Zephram Cochrane Statue is the HERO. Corrections will be made in the next version of the catalog PDF and in the print catalog. The Catalog is broken into sections by show, with the Rick Sternbach original concept art and the Mike and Denise Okuda Crew Gift sections separate, but divided the same way. Each section is themed to the show. The TOS Section uses the Enterprise as its theme. 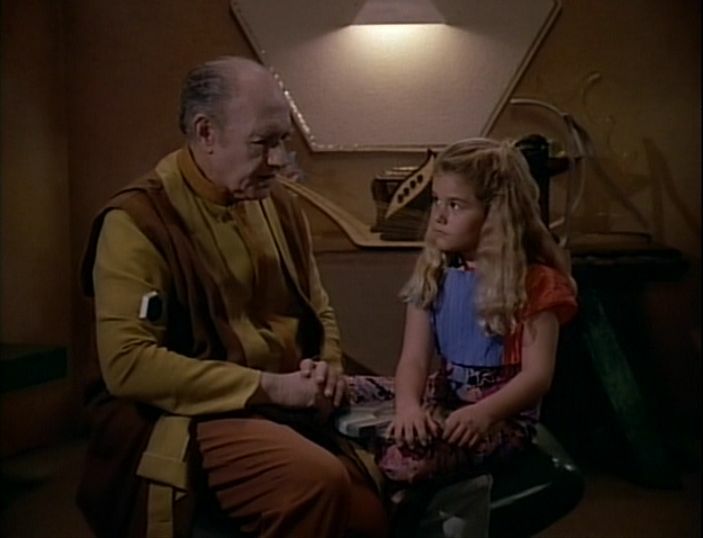 The TNG section is based on the famous Okudagram! The DS9 section has a Cardassian theme. The Voyager section is themed after their nemesis the Borg! The Enterprise section has an Andorian theme. Remember, the live auction is August 8th at the Las Vegas Creation Star Trek convention! We all hope you enjoy this catalog! Well, it is Star Trek auction season! 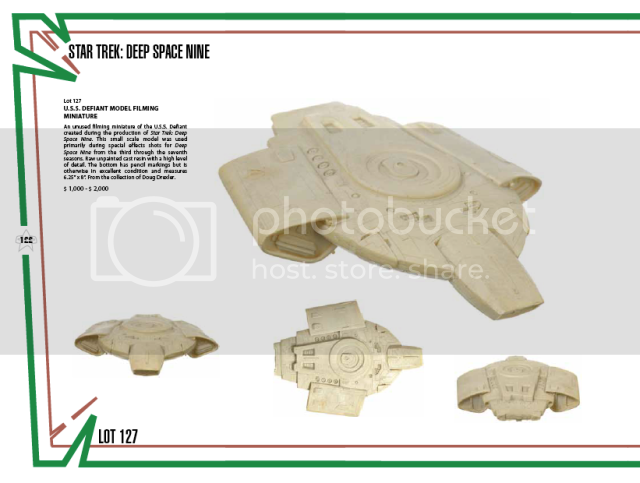 After almost a year of no significant Star Trek auction since IAW sold off everything they had left in a fire sale to Martin Netter from Germany, We now have not one, but three big Star Trek auctions! 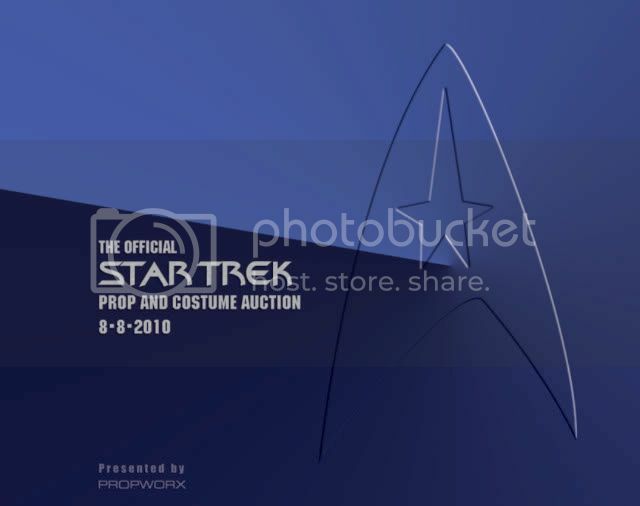 Now, everyone pretty much knows I run Propworx, and we have a Star Trek auction in August. Ours is officially licensed by CBS, of which I am very proud. It is also our first multiple-consignor auction, which presented some interesting challenges and was a lot of fun (We just put the catalog to bed and off to the printer!). So despite this, I am going to, as always, be fair and honest when talking about other auctions because that is what the over 8,000 unique visitors a month I get expect. When it comes to Star Trek, this is the source for info in the hobby and if I get like another prop blogger, and start playing favorites, then I lose credibility with you, the reader. More importantly, you all rely on my expertise in deciding what to bid on sometimes. And I will have more information on the items in the auctions as I go and inspect everything. 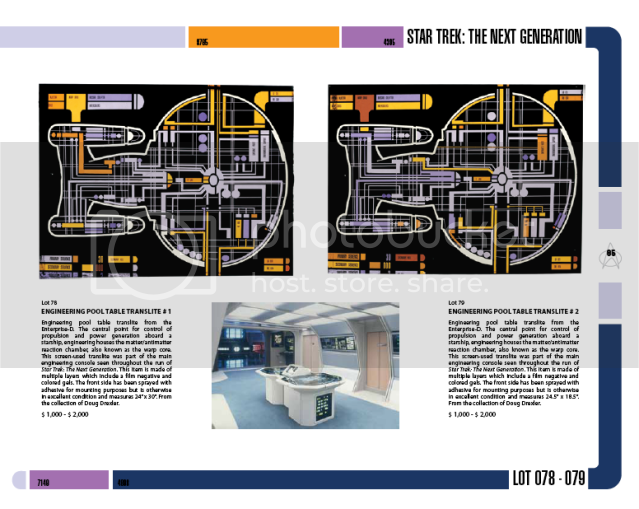 Julien's Auctions released their Star Trek catalog in PDF form this week and you can see it here. The interface is slick, but many have complained (including me) that the "zoom" feature doesn't work. Overall, the catalog is nice, though the designer seemed to like overusing bright colors. The descriptions are good, but Julien's shows its lack of Star Trek expertise by how it devotes entire pages to sub standard costumes (like the Jem H'adar that isn't even complete and is worth maybe $ 300 as is.) The photographs are excellent and the layout refreshing. Julien's does a nice job here and I suggest you all buy the catalog, which is $ 50. As I reported previously here, the auction has the William Shatner memorabilia collection and the Roddenberry estate sale in addition to a few costumes from Majel Roddenberry and the 17 JJ movie items. After talking amongst other collectors, the first impression of this catalog remains: a lot of memorabilia that is not very interesting to serious prop & costume collectors. And the JJ items will certainly sell very high because of their temporary rarity. So overall, not a lot to get terribly excited about. For a complete review of the JJ movie items, check out my previous blog entries here. I will say I think Julien's is a first rate operation and doesn't suffer from many of the problems that Profiles does (more on that later). I think they take their sales very seriously, and quality is very important to them. Everything they do is top notch I think. A few days later Profiles in History came out with their Star Trek catalog, which is basically the third day of their June Hollywood auction, and it is chock full of goodies. The entire catalog has great stuff, which is typical from Profiles. Their catalog however, continues to be sub-standard. It amazes me that despite Profiles being the # 1 entertainment memorabilia auction house in the industry by volume (followed by Julien's, Heritage and Propworx), their presentation ranks last. Propworx, Julien's and Heritage ALL have better catalogs than Profiles. It is sad because they have such great stuff, but choose not to put in the work to highlight those items in a dynamic and interesting way. Now, while Profiles in History is the king of props (With all due respect to the PropKing Jason White! ), they have been known to be sloppy in their authentication process. Heck, two of the items on the cover of their catalogs have proven to be fakes in the last two years, and I have had many problems with their Star Trek items. In the past I have brought to light items that were either misidentified (see here) and Profiles refused to make any correction to the description, or just VERY suspect (see here and here). Everyone should read this article about how Profiles lets consignors write descriptions, and how Profiles doesn't necessarily check everything out in depth. Now do I think Profiles is trying to defraud anyone? No. I just think they are sloppy at times, and in the most fraud ridden hobby out there, you need to be extra vigilant. OK, so on to their Hollywood Auction # 40, of which there are almost THREE HUNDRED Star Trek lots! The vast majority of these items are from one collector who had a connection inside Paramount. 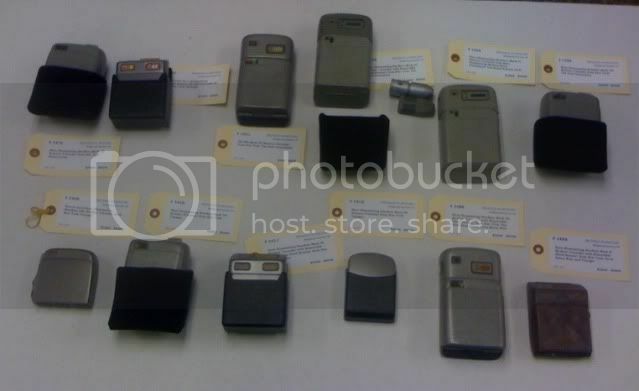 So that is why you didn't see any hero Tricorders in Christie's or IAW's auctions. This is the biggest Star Trek collection of goodies to hit the auction block since Christie's (though the Propworx sale will be twice as large) and there is almost nothing but high quality hand props. Start making your list and planning your budget now, because you will go broke if you are not careful. The good news is that there are SO many good items, that I think prices will be depressed. Early on in the auction, people will be careful and saving their money for later on when other items hit. And later in the auction people will have spent their budgets! I will be writing more about the Profiles auction and go and check everything out in the next two weeks. So stay tuned and join the conversation on the Star Trek Prop, Costume & Auction Forum. Doug Drexler, who writes his own fantastic blog, wrote this blog article that is a must read for Star Trek prop fans. It is reprinted here with his blessing! Way back in the dim dark days of fandom, we created Trek’s first mainstream magazine: The Star Trek Giant Poster Book. We published 12 issues of this little gem before moving on. It was the first publication of it’s type, predating Starlog. All of the content came from our personal collections. We were running the Federation Trading Post on 57th Street in midtown Manhattan, and Fiona Press was right across the street. Somehow they ended up with Trek publishing rights. What did they know about Star Trek? Nothing! In those days if you wanted Trek info we were the only game in town and they fell right into our gravity well. The next thing we knew, we had our own magazine! My single favorite issue is this one…” The Smithsonian Report – A Pictorial Inspection of Star Trek’s Miniatures Today”. The Air & Space Museum in Washington D.C. let us in before the doors opened, and even gave us a ladder to get up close and personal with the TOS Enterprise filming miniature. I was in heaven. I climbed the ladder with anticipation, and planted one on the leading edge of the saucer. So here it is, Poster Book issue 10 – ” The Smithsonian Report”. I’ve scanned it at extra hi rez, give it a click and enjoy the slingshot! Note that you can click on these images and see close ups so you can read them. Also, this issue of the Poster Book is readily available on eBay with a BIN of about $ 15. I just bought one myself. Wah Chang is one of the great unsung heroes of Star Trek. 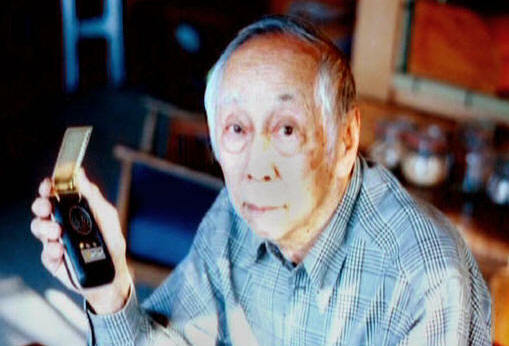 Born in 1917, Chang showed an immense capacity for creative thinking and problem solving from a young age. By the time he was seven years old, Chang was already experimenting at creating art in various mediums and those around him encouraged him to continue. 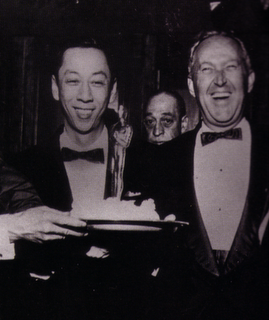 In the 1930s, Chang began to experiment with puppets and stop-motion photography. He worked for Disney creating wooden puppets for the animators to study as they worked on Pinocchio and Fantasia. From there, he went on to design toys and puppets, some of which were used for commercials. In 1957, Chang and two friends formed a company called Project Unlimited, Inc. Together, they created costumes, props and special effects for films and television. Most notably, they did extensive work on The Time Machine for which they would win an Oscar. Chang co-designed the elaborate headdresses for Elizabeth Taylor in Cleopatra and went on to do a great body of work for producer Bob Justman on The Outer Limits. Chang’s association with Justman led to work on the first Star Trek pilot in 1964. He designed the make-up for the Talosians and also the first phaser. 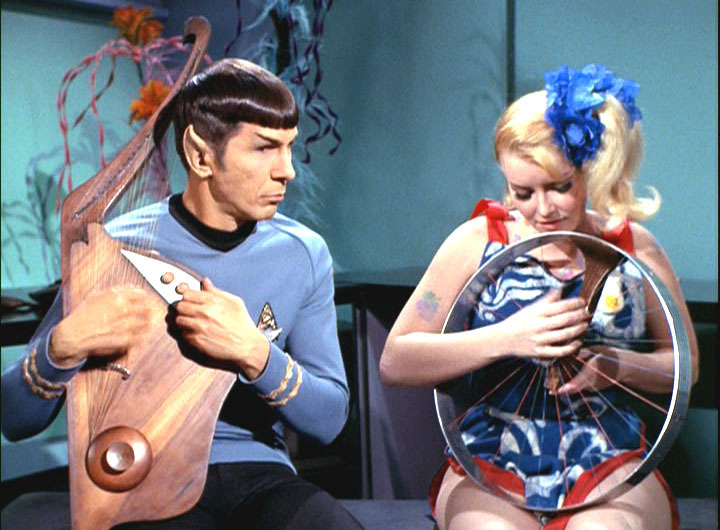 Though uncredited for his work, Chang went on to design many of the most famous props and creatures for TOS, including: the Communicator, the Tricorder, the Romulan Bird of Prey, Romulan helmets, the Salt Vampire, the Gorn, Balok, the Tribbles and finally, Mr. Spock’s Vulcan Lyre. The Vulcan Lyre (also sometimes called a harp or lute) made its first appearance in the early episode “Charlie X.” It made several other appearances in TOS (“The Conscience of the King,” “Amok Time” and “The Way to Eden”). Chang’s original prop was made of a single piece of solid wood and featured a filament strung up and down multiple times to give the impression of many strings. It was not a functional instrument. After TOS, it was painted black and featured in an episode of Mork and Mindy (many Star Trek props and costumes found their way on to this show). 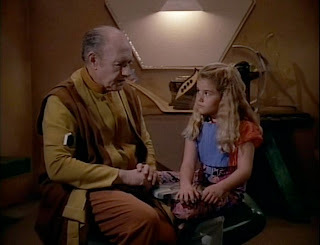 The next time we would see a Vulcan Lyre was in the 1988 TNG episode “When the Bough Breaks.” It can be seen behind Melian (Paul Lambert) the Aldean musician as he instructs Katie (Jandi Swanson). Mike Okuda borrowed this replica for the set from Gene Roddenberry who kept it in his office. 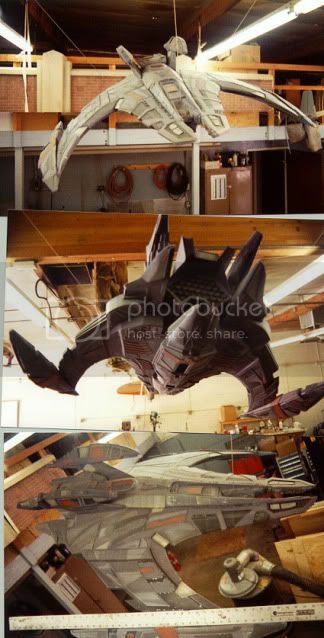 In 1989 Paramount engaged the services of Dominick Giovanniello at Creative Guitar Studios in San Diego to create licensed replicas of the prop. Unfortunately, the company only held the license for about two years before going out of business but in that time they created at least 25 replica lyres. These are working instruments that make sound when plucked though all the knobs are non-functional. Instead of being solid, they are hollow which allows for the strings to vibrate and create sound. They are strung with 12 wire-wound steel electric guitar strings. Besides only having 12 strings there are a couple of other differences between this replica and Chang’s original. First is that the bottom corner is rounded where the original is pointed. Also, on the original, where the neck meets the body, the neck is thicker than the body. Because these replicas are hollow they have a thin piece of wood on the front and back which makes the body thicker than the neck. These images come from one of Giovanniello’s lyres when it was sold on eBay. 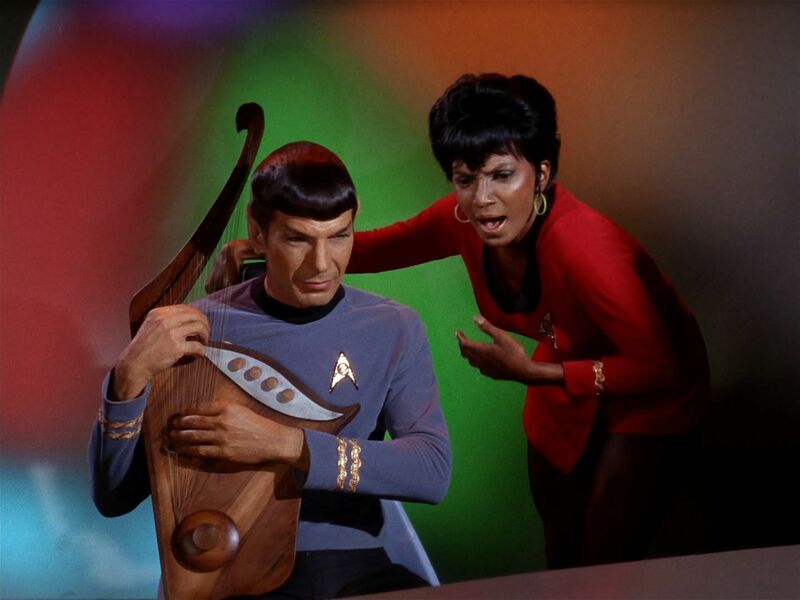 In Star Trek V: The Final Frontier (1989) Spock plays his Vulcan Lyre around the campfire with Kirk and McCoy in the final scene. Based on the appearance of the bridge and the number of strings it seems this was one of the Creative Guitar Studios replicas. However, I have not been able to confirm this. 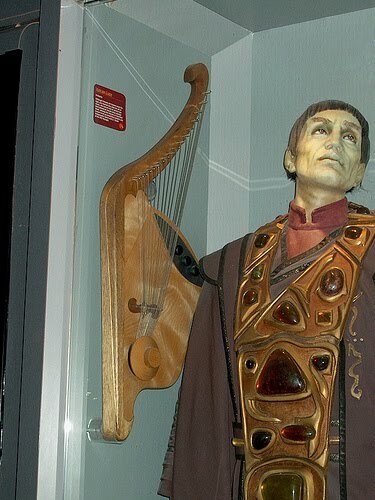 One of Giovanniello’s lyres was purchased by Doug Drexler who loaned it to the Star Trek prop department for use on ST: DS9 and ST: Voyager. Drexler’s replica was used in the ST: DS9 episode “Through the Looking Glass.” Intendant Kira Nerys (Nana Visitor) had several Vulcan slaves in the Mirror Universe. 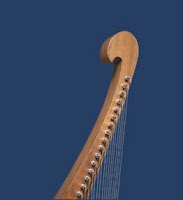 The lyre can be seen in her quarters in this episode. Drexler’s replica was also used for two appearances on ST: Voyager where it belonged to Tuvok (“Persistance of Vision” and “Riddles”). 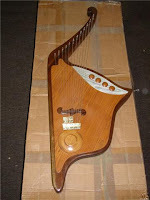 Following its appearances on ST: Voyager, Drexler retrieved his lyre from Property Master Alan Simms. It was later sold by Propworx to Star Trek Prop and Costume Forum member, Donna Sakaida. 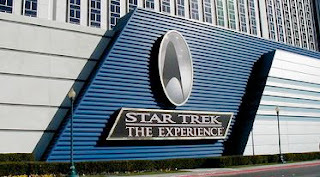 When the Star Trek Experience opened in Las Vegas in 1998 it included a museum of props and costumes. One of Giovanniello’s replicas was modified for use in this display. This version has 17 strings rather than 12 and the bridge has been altered so the strings originate under the round disc as they did on Chang's original. You can see from the blonde wood that these replicas did vary somewhat. Also for the Experience, Paramount commissioned HMS Creative Productions to create replicas that were offered for sale in the Admiral’s Store. 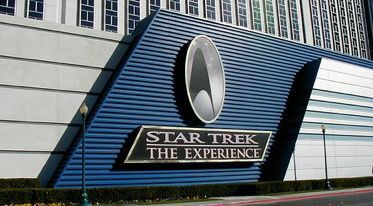 HMS had a long relationship with Paramount, frequently helping to create props for the Star Trek films and television series. 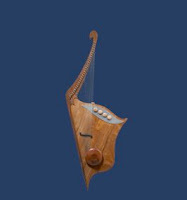 They were given a tracing of a lyre and some screenshots from which to develop a replica. Later, Roddenberry.com hired HMS to create replicas to sell online. Now experts, HMS craft replicas that are almost dead ringers for Chang’s original prop. The ones sold on Roddenberry.com feature the pointed bottom corner and thicker neck of the original. 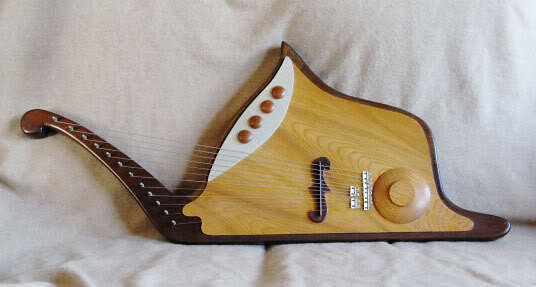 They also feature 30 strings which is more in line with the number Chang intended. 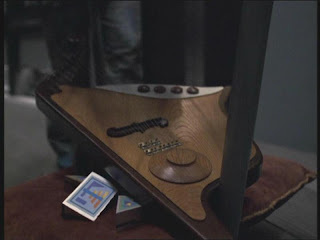 During the fifth season of ST: DS9 (1996-1997) Doug Drexler discovered a small lock-up of items that had been used on Mork and Mindy under Paramount Stage 18. Included was Chang’s original prop! No one seems to know what has become of it now. Some TOS costumes that were altered for use on Mork and Mindy were sold by Christie’s. Hopefully, someday, the original lyre will re-surface. In 1994, Wah Chang was awarded the George Pal Memorial Award by the Academy of Science Fiction, Fantasy & Horror Films to honour his many contributions to genre filmmaking. Chang continued his creative life until he died in 2003. Towards the end of his life, he created beautiful bronzes and animal sculptures. At the time of his death, an exhibition of his work was on display at the Chinese Historical Society of America in San Francisco. I would like to acknowledge the generous assistance of Doug Drexler, Donna Sakaida and HMS Creative Productions. Without their research it would have been impossible to compile this history.